Enjoy the magical redwood forest known as Armstrong Redwoods State Natural Reserve, one of the most beautiful sights in the world with Coastal Sequoias (Redwoods) that are taller (310 feet/95 meters), bigger (15 feet/4.6 meters wide), and older (1400 years old) than the trees in Muir Woods. This grove is more spectacular than Muir Woods. We guarantee it. You will also have an opportunity to visit 3 wineries and sample some of the finest wines California has to offer. Lunch is included and will be served at the first winery. After the wine tasting, we will start on our return to San Francisco with a drive to the Marin Headlands, which provides stunning views of the Golden Gate Bridge and San Francisco beyond. This is an excellent opportunity to take some memorable photographs. Start your day by getting picked up from your San Francisco hotel in one of our 15 passenger Mercedes Benz Sprinters. We will then take you up Highway 101, and into a magical redwood forest known as Armstrong Redwoods State Natural Reserve. Armstrong Redwoods SNR is one of the most amazing and beautiful sights in the world with Coastal Sequoias (Redwoods) that are taller (310 feet/95 meters), bigger (15 feet/4.6 meters wide), and older (1400 years old) than the trees in Muir Woods. This grove is more spectacular than Muir Woods. We guarantee it. Before we arrive at the park, we will make a quick stop at a café for drinks and snacks. 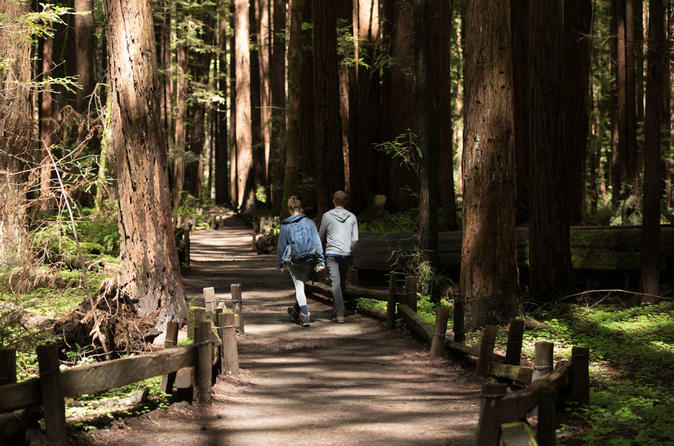 Once in the grove of redwoods, you will have a special opportunity to take a peaceful walk amongst these beautiful and awe-inspiring redwood trees by following a marked trail. There is also a seasonal waterfall here! You will spend at least one and a half hours in Armstrong Redwoods. We will then leave Armstrong Redwoods and continue onto our first winery. On our drive through the wine region, you will learn about California’s wine country, including the history of the wine industry in California, the geography of the region, and why this area is so perfect for growing grapes and producing wine. While in wine country, you will have an opportunity to sample some of the finest wines California has to offer. We will visit three wineries. Lunch, which is included in the price of the tour, will be served at the first winery. You may also walk the grounds of the wineries and take in the fresh California air. We have carefully chosen wineries for you after extensive experience touring many wineries. We know how well these wineries treat our groups and how fine their wines are. The tastings are all complimentary and included in the price of the tour. After the wine tasting, we will start on our return to San Francisco with a drive to the Marin Headlands, which provides stunning views of the Golden Gate Bridge and San Francisco beyond. This is an excellent opportunity to take some memorable photographs. We generally arrive back to San Francisco around 6:00 P.M.